Genre mashups are a hit or miss affair. You need only look as far back as Cowboys and Aliens for a case study on how to ruin an interesting idea. 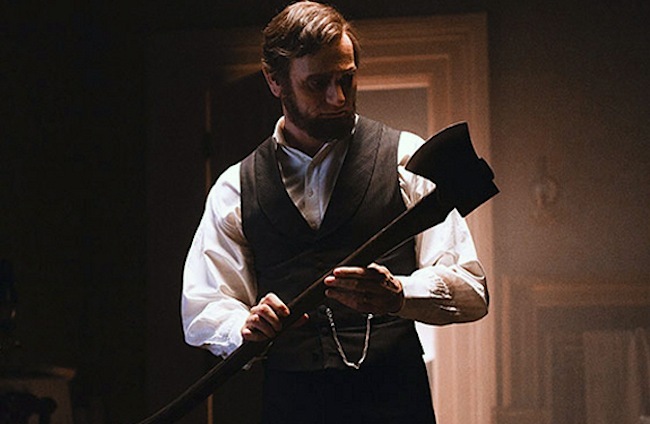 Abraham Lincoln: Vampire Hunter sees America’s sixteenth President, Honest Abe, raise an axe in a war against a race of bloodsucking vampires – as if he didn’t have enough trouble ending slavery. As ridiculous as it sounded, most of us scratched our heads after seeing the trailer but bravely proclaimed, “Finally, a vampire story that’s not about sexually frustrated necrophiliac teenagers.” It is so very easy to get excited about a Tim Burton-produced film, but Vampire Hunter is ultimately bitterly disappointing. 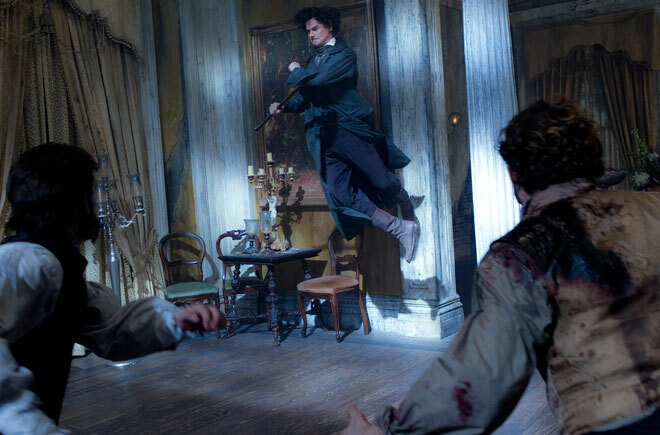 The screenplay is based on a popular off-beat novel by Seth Grahame-Smith (Pride and Prejudice and Zombies). It juxtaposes a vampire story with the American Civil War. 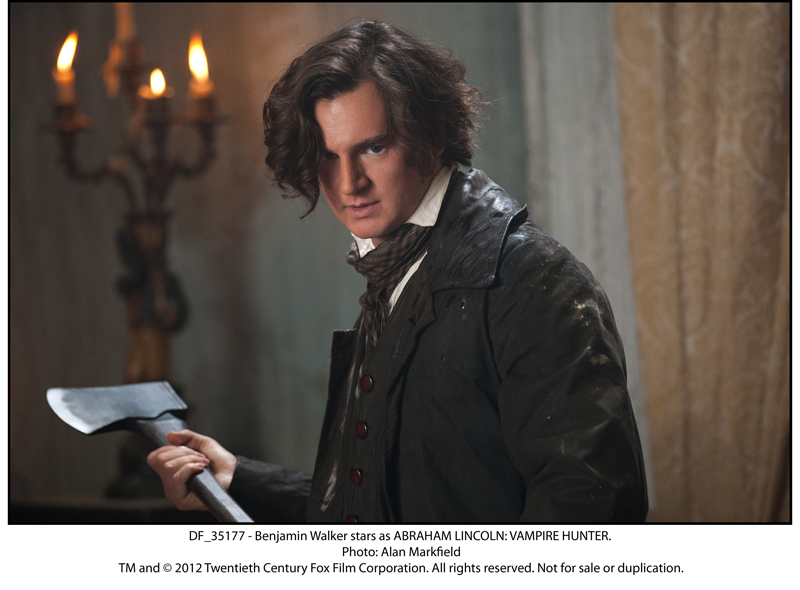 The energetic Abraham Lincoln: Vampire Hunter is a ridiculously wild anything-goes film that’s hard to take serious, earning a high place on the list of most shamefully Hollywood movies of the year. Completely incoherent, the story surely takes place in an alternative universe because the Lincoln we meet in this adventure is nothing like the one we’ve encountered in history books. Benjamin Walker’s Lincoln is weak and dreary, unlike the real historical figure, a man with the good sense to create the Emancipation Proclamation. A 10-year-old Lincoln watches his mother die an early death, a victim of a vampire. Abe swears revenge. Years later he comes face to face with the killer, but is unable to defend himself against the monster. Abe is rescued by a stranger, who teaches him the necessary skills to become a vampire hunter. His weapon of choice is an axe, which he uses to violently plow through a good number of vampires disguised as city folk. By day, Abraham studies law and works in a store, but by night he becomes a ruthless killer and a target for more notorious vampires. There are a few sequences that verge on exciting, but the story cuts too quickly between characters and never takes a second to breathe. Abe’s romance story with Mary Todd is tedious, and worked into the story as an afterthought. The same can be said about his friendships with Speed and Will Johnson, his fellow huntsman. Everyone delivers a sub-par performance. It’s certainly far from an A-list production, bar the 3D and CGI, which was actually up to standard. I left the theatre singing Sam Cooke’s Wonderful World, “Don’t know much about history, don’t know much biology”, a fitting theme song for the movie. I was really hoping this would be a great movie. All those skeptics can keep their “I told you so’s”.